33 kilometers away is the ‘capital’ of the Dordogne department and is set towards the north of the region. Many miles from the Dordogne River, it is actually found on the Isle River. The town has been in existence since neolithictimes, and later became an important Roman centre. The town suffered a great deal in the Middle Ages through the Hundred Years War and other conflicts in the region, then had a ‘rebirth’ – and much construction in the town dates from this time – in the 16th century. From the 18th century onwards, Perigueux continues to be an important centre for the region. Perigueux also contains an interesting medieval and renaissance centre, with attractive boulevards and streets lined with medieval houses to explore – these are concentrated in the region around the cathedral Saint Front, which also retains itsattractive arched cloisters. Next walk to the attractive Place de Navarre with its 16th century buildings. One of many attractive spots in Perigueux to sit outside and enjoy a coffee or stop for lunch. Nearby on the Rue Aubergerie is the 15th century fortified Abzac de Ladouze residence and also on the street the Sallegourde building – both homes to wealthy merchants in the 15th century. The House of the Ladies of the Faith on Rue des Farges dates back to the 12th century and became a convent in the 17th and 18th centuries. From here continue to the Place de l’Hotel de Ville where as well as the town hall there is a fortified house dating to the 15th and 17th centuries. One of Perigueux’s most celebrated buildings – the Maison du Patissier- is on the nearby St Louis Square. The Maison du Patissier was built in the 14th century and has a wonderful 16th century Renaissance door crowned by a scallop shell (symbol of pilgrimage). 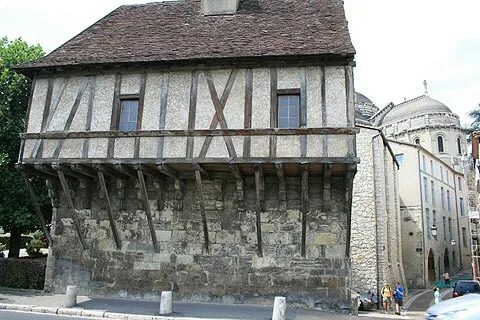 The ‘patissier’ who lived in the building made the reputed Perigueux ‘paté de foie gras’. This is still one of the gastronomic highlights of this area, make sure you don’t miss it. Even better is foie gras poêlé which is pan fried duck liver and is our favourite dish, by far, of the region. The St Louis square is still home during the winter months to the fattened poultry market. Next is Rue Limogeanne which for me is the highlight of Perigueux, it is a lovely street full of interesting buildings with inner courtyards, ornate carvings around windows or doors and full of atmosphere. Doubling back from here, head for the Place du Marche aubois with its Baron Hausmann style architecture and then go to the Place de la Vertu which is one of the prettiest squares in Perigueux. Follow the Rue Notre Dame and the Rue Barbecane and on to the Rue de l’Abreuvoir for a lovely view of the Fayolle Residence. The narrow Rue de l’Abreuvoir was used in the filming of “Jacqou Le Croquant” film of a popular French book by Eugene Le Roy. Descending to the river, there is an ensemble of particularly attractive medieval houses – the 16th century ‘maison Lambert’, the 15th century ‘maison des consuls’, and the 17th century ‘hotel de Lur’. These are best admired from the bridge that crosses the river at this point. From here you not only see these three buildings but also the cathedral and a building known as ‘the old mill’ whcih used to be a look-out post. Head back up the Rue de Tourville and Rue de la Nation, skirting round the side of the cathedral and then in Rue de la Constitution is the wonderful Saint Front residence. With a lovely balcony and mullioned windows this is one of the most attractive buildings in Perigueux. The Galerie Daumesnil is a cluster of narrow streets which have a wonderful selection of architectural detail. Coming out on Rue Limogeanne you can see the magnificent Estignard Residence with its impressive wooden doorway surrounded by a carved stone tympanum with a Salamander – symbol of King Francois I. Ahead is the Place de la Clautre, once the place for public executions it is now used for the Wednesday and Sunday morning markets. 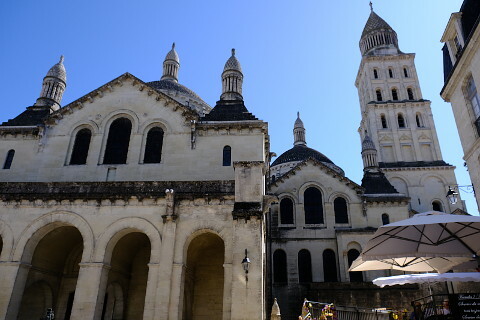 Last but not least is Perigueux’s wonderful Byzantine cathedral. Its cluster of domes can be seen all around the city and from the outside it is one of my favourite cathedrals in France (I find it a bit sombre on the inside). It is a UNESCO World Heritage Site and has a Greek cross ground plan similar to St Mark’s cathedral in Venice. It is the model for the Sacré Coeur church on the top of the hill at Montmartre in Paris. A little to the east of Medieval and Renaissance Perigueux are a cluster of buildings dating back to Roman times. The Vesuna Temple was constructed in 2 AD. The only remaining part is the “cella” which is the sacred part that only the priest was allowed to enter. The tower is 27 meters high. Much of the tower was removed and the stone used in other buildings before it was protected in the 19th century. The Norman Gate was built during the Late Roman Empire and was part of the defensive wall which enclosed the city. The Gallo Roman defensive wall became the foundations for the medieval buildings. Looking at the walls you can see where the roman wall gives way to the medieval wall. The Maison Romane is a good example of this. In the Roman part of town you can also admire the remains of Barriere Castle which was built in the 12th century but burnt down in the Wars of Religion in 1575. Also see the Eglise Saint Etienne de la Cité which was the cathedral of Perigueux until 1577 when protestants destroyed parts of the building. The Musee du Trompe de l’oeil is next to the church. 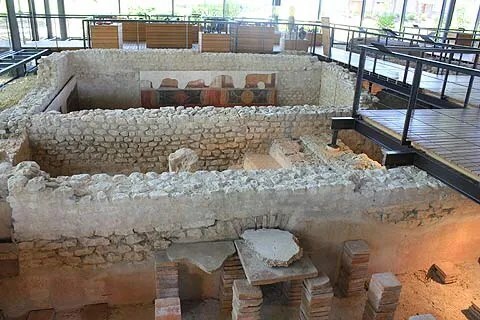 Next to the Vesuna temple the Gallo Roman Vesunne Museum has been built around the remains of a gallo-Roman villa. The museum was designed by architect Jean Nouvel and is a very attractive modern building in its own right. Mosaics, underfloor heating systems and the layout of the villa are clearly visible and raised walkways allow you to fully explore the remains of the Roman Villa. TV screens recreate many of the rooms allowing you to see what the villa looked like originally. Tickets cost 6€ for adults, 4€ for under 25s and free for under 6s. Family groups are 12€. The Perigord Museum of Art and Archaeology is found in the town and houses important prehistoric and roman artefacts. The Trompe l’oeil Museum and Workshop tells the history of trompe l’oeil. In the summer it is possible to do a tour of Roman or Medieval and Renaissance Perigueux with the tourist office. There is also a bike tour of the gardens and on Monday nights torchlit tours of the city. The attractive Chancelade Abbey can be found on the edge of Perigueux. Bourdeilles is a very pretty village and you can also explore the Chateau de Bourdeilles.